Here, you’ll be spellbound as the Northern Lights cavort. You’ll catch sport-fish straight from the record books. You’ll run rivers through unpeopled valleys where creatures thrive wild and free. And you’ll meet people with the same frontier spirit –with big hearts and hearty greetings, welcoming you to our ancient land. 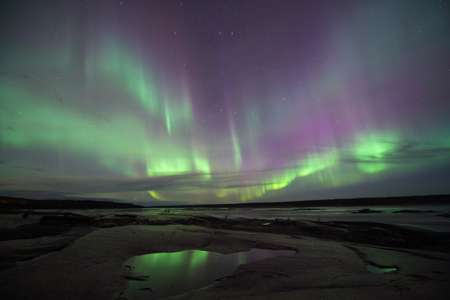 Scientists confirm: Yellowknife is your finest viewpoint for the fabled Northern Lights. Our crystal-clear skies, perfect geomagnetic location, and first-class tour operators means that nearly every night you will enjoy a front-row seat as the heavens give you a show. The NWT is your front-row seat to the best and brightest Aurora in the world. Our lakes are legends. Great Bear and Great Slave are two of Canada’s biggest, flanked by gold-flecked cliffs and dappled with unexplored isles. Even better, their virgin depths are patrolled by the largest sport-fish in North America – pure, strong, and hungry for your hook. 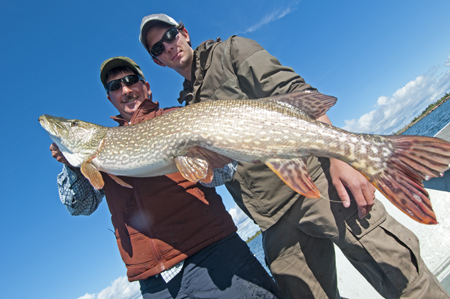 A typical catch on Great Slave Lake, where the pike are feisty, tasty and huge. 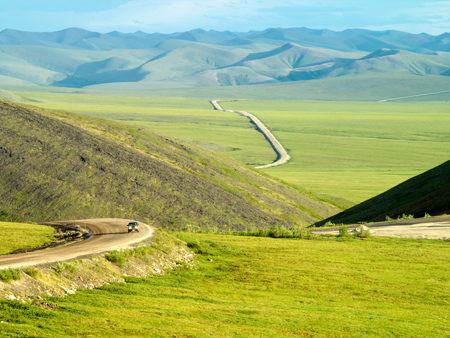 We’re a wilderness you can drive to – a quick detour off the Alaska Highway, or a scenic road trip from Edmonton. Our roads are vast, uncrowded and well maintained. What you’ll see out the window is rugged and wild. There’s far more scenery than traffic on NWT highways. The Nahanni. The Coppermine. The Thelon. The Mackenzie. They’re waterways whose names set paddlers to dreaming. Well, stop dreaming and start packing. Thanks to our expert guides and first-class outfitters, our wild rivers are well within your reach. Imagine a city where skyscrapers leap from the boreal forest. Where candy-coloured houseboats bob in the bay. Where floatplanes buzz above cabins and mansions, soaring to the diamond mines. And where a rich blend of cultures lives in robust harmony in Canada’s great capital of cool. 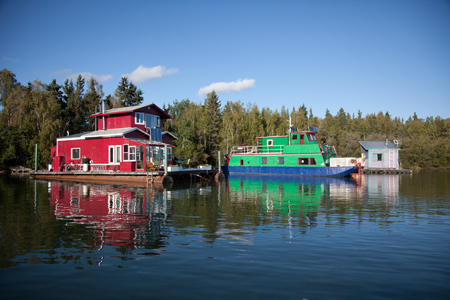 Waterfront real estate in Yellowknife’s favourite neighbourhood, Houseboat Bay. In summer, Folk on the Rocks brings the nation’s best known bands to a euphoric celebration under the midnight sun. In winter, the Snow King Winter Festival sees visitors revel among ice-sculptures beside a castle made of snow. In all seasons, the Northwest Territories is a party like no other. 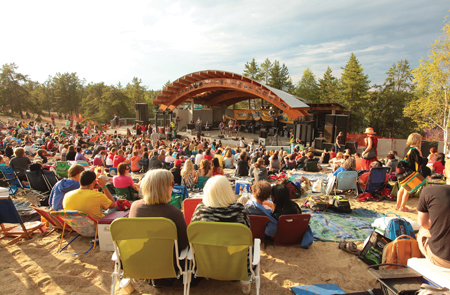 Yellowknife’s Folk on the Rocks festival is the town’s hottest ticket. Collectors covet Northern arts and crafts. Here’s a shopping list to get your started: Beaded, smoke-tanned moosehide moccasins from Great Bear Lake. A woven birch-bark basket from the forests near Fort Liard. Jewellery featuring diamonds from the Barrenlands or muskox horn from Banks Island. And an Inuit stone-cut print, depicting traditional life along the Northwest Passage. 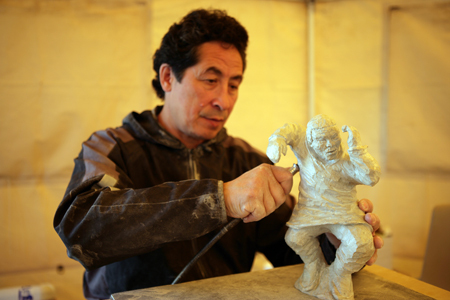 With a wealth of artists and craftspeople, the North’s traditions are carved in stone. Drive the Waterfalls Route and you can picnic, hike and camp beside stunning cataracts – two-tiered Louise Falls in the Hay River Gorge, or serene Lady Evelyn Falls, where grayling leap in the spray, or thundering 32-metre Alexandra Falls. Then catch a floatplane to the granddaddy of them all, earth-shaking Virginia Falls, twice the height of Niagara and the plum of Nahanni National Park Reserve. 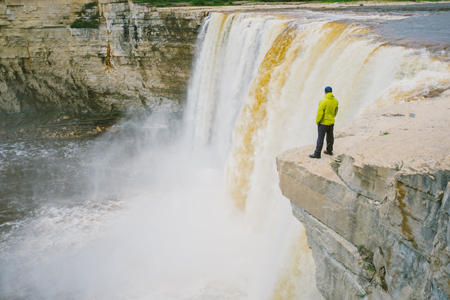 A traveller gets the scenic view of Alexandra Falls, just north of the NWT-Alberta border. 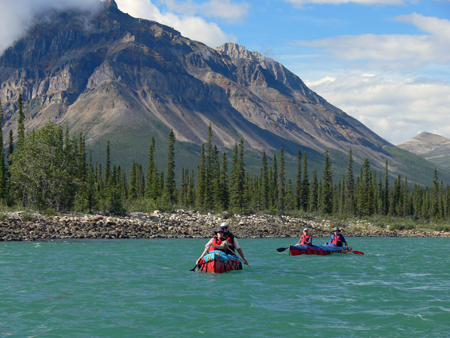 Plan a trip to our spectacular frontier by staying in a Northwest Territories B&B. Whether you’re coming to the capital city of Yellowknife to experience the urban North or heading to a remote village to hear the sound of silence, BBCanada.com offers a rich array of choices for your Northwest Territories adventure. Visit www.spectacularnwt.com for more information. Discover thousands of B & Bs across Canada with the new BBCanada.com iPhone app. Download your iPhone app today‚ free! The E- Traveller content is provided by the association or tourism organization listed.